UFO Moviez and Crown Infotainment, the companies that have won the rights for in-theatre telecast of IPL-III, have run into a conflict with producers’ associations in Andhra Pradesh, Karnataka, Kerala and Tamil Nadu. IPL and UFO movies had planned to show live matches in single screens and multiplexes as well beginning march 12. 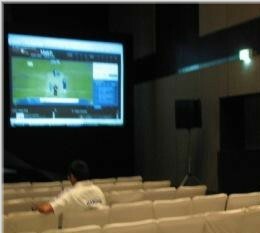 The IPL 3 committee and UFO movies had struck deal with 629 theaters across India to show live matches. In Belgaum CHITRA theater was also listed in the theaters list which was supposed to show the matches live but the The Kannada Film Producers Association has raised objection of screening the matches live in cinema halls. Kannada film producers, reeling under losses, have opposed the live telecast of IPL cricket matches in multiplexes. If multiplexes and single screens show IPL matches then the screens available for showing Kannada movies will be very less. As of today still it is uncertain whether Live matches will be shown in Belgaum or no. So the IPL fans planning to enjoy the matches like in the stadium will be dis heartened for sure.